DreamCatcher Interactive has licensed the feature film rights for the hit FPS Painkiller to Guy Walks Into a Bar Productions. Jon Berg and Todd Komarnicki of Guy Walks Into a Bar will produce the movie along with Matthew Weinberg. DreamCatcher Vice-President George Chastain said in Daily Variety that the company chose to license the property for a movie production in part because the Guy Walks Into a Bar team plans to maintain the "fast-paced action, the wide array of weaponry and cast of demonic characters" in the adaptation. This is the first time the company has sold the feature film rights to one of its properties. 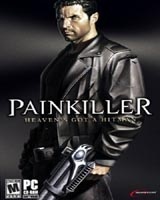 Developed by People Can Fly and released in 2004, Painkiller quickly gained notice for its frenetic FPS action and large, unique level designs. The game was a surprise hit, and spawned the Battle Out of Hell add-on as well as an Xbox release entitled Painkiller: Hell Wars. A sequel is currently in development. Guy Walks Into a Bar Productions recently completed work on Starship Dave, starring Eddie Murphy. Previously, the company was involved in the Will Ferrell vehicle Elf.